Making the Most of Mealtimes is the largest study of its kind to explore food and nutrition in long-term care, and the role of the mealtime experience. Although it is both preventable and treatable, there has been very little research looking at the reasons behind poor food intake in long-term care, and how it can be improved. 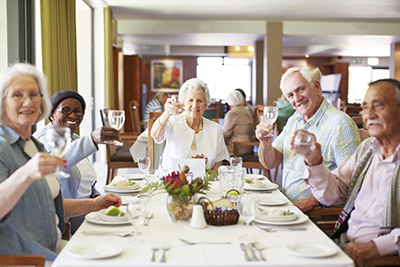 Making the Most of Mealtimes (M3) is the largest study of its kind to explore what residents living in long-term care eat and what factors promote better nutrient intake. The study took place from 2014 – 2016. Information was gathered from over 600 residents, across 32 homes in 4 provinces (Alberta, Manitoba, New Brunswick and Ontario), and the key findings are in! - Daily food and fluid intake was low for many residents in the M3 study. - The 9 nutrients most likely to fall below recommendations were vitamin D, vitamin E, folate, vitamin B6, vitamin K, calcium, magnesium, potassium, and zinc. - Residents who ate fewer calories and protein were more likely to be female, at risk of malnutrition, of older age, consumed pureed foods, had a number of eating challenges during mealtimes (e.g., trouble holding food in the mouth, little or no interest in eating), and required some but not total support for eating. - Residents who ate more calories and protein were more likely to live in a memory care neighbourhood, need total eating assistance, and received person-centered care at mealtimes (e.g., their preferences, needs and values were respected). - Residents who had better protein intake were more likely to live in homes with more dedicated dietitian time.